On some level, we are all into subduction. But not many of us apply for the license. 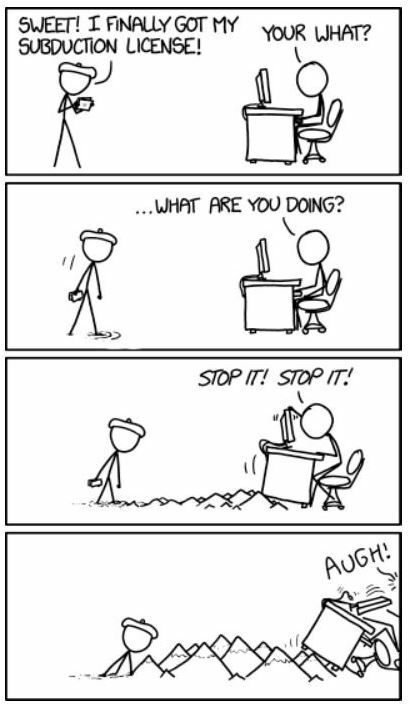 If you sometimes follow Randall Munroe’s creative web comic xkcd, then you may have seen this comic. What does it mean? I’d like to drone on philosophically, but I have to admit that I’m not sure what xkcd has in mind with this one. For me, it is funny just because it is unexpected. It is like a photo I used in my book, The Mountain Mystery. The picture shows of the back of guy at an outdoor concert wearing a T-shirt with “STOP PLATE TECTONICS” in big bold letters. You don’t expect geological anarchists at music festivals, nor do you expect the next guy coming into your office to have a subduction license in his hand. And what of subduction? Does it work like Munroe’s comic suggests? Or is it more like an unlicensed train wreck? (Not that licenses are actually issued for train wrecks.) If you remember your introductory geology courses (or grammar school lessons as plate tectonics is now taught in Grade 3) then you were shown that the Earth has plates that are moved by convection currents in the mantle and if two plates are headed to the same place, there is likely to be a messy collision. The heavier plate will eventually sink – or subduct – below the lighter one and cause quite a lot of damage in the process. Maybe this is what you actually get to do with your subduction license. The subducting crust bends sharply and plunges deeply into the mantle. It will melt and merge and circulate and . . . well, it’s still all rather fuzzy with a lot of unknowns. How deep does the crustal material actually go; what temperature does it reach; how much do the materials mix; and how long will it take before it re-emerges are among the hotly contested questions. 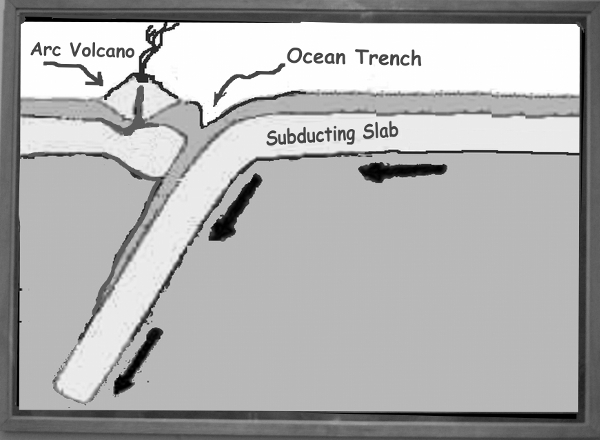 What we do know is that the subduction thing is probably more accurately described by this diagram than the drawing that began this blog entry. This entry was posted in How Geophysics Works, Plate Tectonics and tagged convection, geophysics, subduction. Bookmark the permalink.